England signed off their disappointing World Cup campaign with a consolation victory over the Uruguay in Manchester by running in ten unanswered tries in a 60-3 thrashing of the South Americans. Nick Easter became the third oldest World Cup try-scorer as the No 8 scored his second England hat-trick at the home of Premier League side Manchester City. Jack Nowell, not to be outdone by the elder statesman, helped himself to a second half treble. Anthony Watson scored a brace, while Henry Slade’s debut tournament try added to the fifty-point rout. Owen Farrell kicked for conversions for an eight-point haul, Ford added a conversion, while Uruguay flyhalf Felipe Berchesi’s first minute penalty kept his team from being nilled. The result of this match was always going to have no relevance once England’s fate was sealed against Australia last weekend. Stuart Lancaster rang the changes against the mostly amateur side, who only scored their first World Cup try in twelve years in an ill-tempered game versus Fiji. Uruguay took the lead inside ninety seconds through flyhalf Felipe Berchesi after England were penalised for going offside inside their 22m. It did not take long for the home team to get on the scoreboard. Watson kicked behind the flat defence and beat the defenders and dotted down close to the dead-ball line. Farrell’s conversion took the score to 7-3 after eight minutes. England controlled most of the possession in the next ten minutes. Silly errors from England and strong defence from Uruguay could not stop Easter from scoring a first-half brace. The 37-year-old, who was a television pundit at the start of England’s ill-fated campaign, became the tournament’s third oldest try-scorer when his pick-and-go from Danny Care two metres out, increased the lead to 12-3. The number eight’s second try came after a five-metre line-out was collected by Geoff Parling, the forwards set-up a driving maul that bulldozed the opposition forwards. Farrell kicked both conversions for a 21-3 lead at half-time. Uruguay’s captain Santiago Vilaseca was yellow carded for a repeated infringement when he went off his feet at the ruck, giving the bank clerk a 20m rest. The final 40 minutes was a chance for England to give their northern fans something to cheer about: and they did. A scrum in a central area inside Uruguay’s 22m saw Easter pop the ball to Care, the scrumhalf drew two defenders and passed to Farrell, some slick hands from the centre and Henry slade created the opening for Watson’s second try. Farrell missed his first conversion of the tournament but England had started with some intent for a 26-3 lead. England started the match trying to play high-tempo running rugby which accounted for many handling errors; they attempted the same after the break, when they should probably have kept it tight. Mistakes continued as the game became scrappy. England’s traditional power lies in their forward pack, however, the carnival rugby was leaden. With both teams giving away possession something had to give. It did on 54 minutes when Slade scored his debut World Cup try. 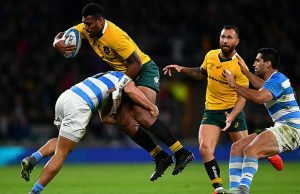 It came from a charge-down from scrumhalf Agustin Ormaechea attempted box-kick by the centre, who kicked ahead and collected the rolling ball in the left hand corner. Farrell could not add the extras and the game was now over as England led 31-3. Three minutes later Nowell got in on the act. Some smart footwork from Alex Goode set-up Care, the scrumhalf beat the defenders and put the winger in for an easy score. Farrell made no mistake, the conversion taking the score to 38-3. England got a line-out on the 22m shortly after the restart and from that they form a driving maul, drove towards the try-line and Easter had his second England hat-trick. 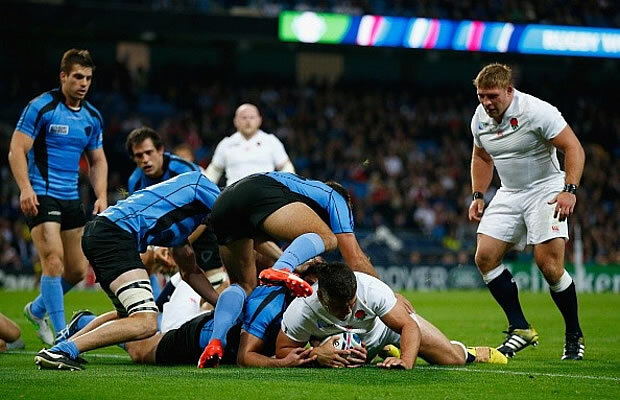 Ford’s attempted conversion was wide, but England led by 40 points with 15 minutes to play. Uruguay came close after the restart but could not get over from close range. 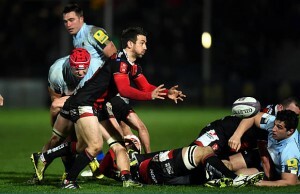 England were not finished; Nowell scored two tries and collected a hat-trick. Ford could not convert either but did get the last two points when Chris Pollock awarded a last minute penalty try and England bowed out of their home tournament on a high. England: 15 Alex Goode, 14 Anthony Watson, 13 Henry Slade, 12 Owen Farrell, 11 Jack Nowell, 10 George Ford, 9 Danny Care, 8 Nick Easter, 7 Chris Robshaw (captain), 6 James Haskell, 5 Geoff Parling, 4 Joe Launchbury, 3 Dan Cole, 2 Tom Youngs, 1 Mako Vunipola. Replacements: 16 Jamie George, 17 Joe Marler, 18 David Wilson, 19 George Kruis, 20 Tom Wood, 21 Richard Wigglesworth, 22 Jonathan Joseph, 23 Mike Brown. Uruguay: 15 Gaston Mieres, 14 Santiago Gibernau, 13 Joaquin Prada, 12 Andres Vilaseca, 11 Rodrigo Silva, 10 Felipe Berchesi, 9 Agustin Ormaechea, 8 Alejandro Nieto, 7 Matias Beer, 6 Juan Manuel Gaminara, 5 Jorge Zerbino, 4 Santiago Vilaseca (captain), 3 Mario Sagario, 2 Carlos Arboleya, 1 Mateo Sanguinetti. Replacements: 16 Nicolas Klappenbach, 17 Oscar Duran, 18 Alejo Corral, 19 Mathias Palomeque, 20 Diego Magno, 21 Agustin Alonso, 22 Alejo Duran, 23 Manuel Blengio.